I have run the Ave half marathon twice. They changed the course in 2011 to the second half of the full marathon. That was a good change since the road is pretty rough on the first half. This is a great race and I really think it is one of the most beautiful races in North America. The location and the people really makes it special. Early in 1972 the running scene in Humboldt County was just starting to boom. Hunboldt State had recruited a number of outstanding runners, some of them national class in caliber. The Six Rivers Running Club had just been formed and was putting together a series of races for its members. A number of local runners were looking for a marathon to run which would give them a chance to qualify for the 1972 U S Olympic Trials and others were simply looking for a local marathon. 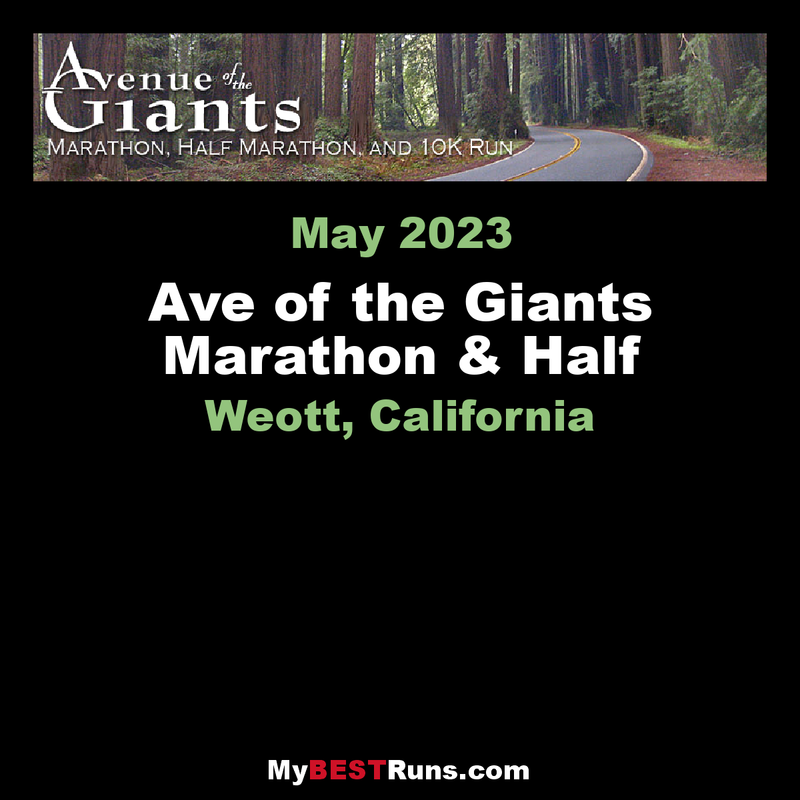 Thus in early May of 1972 the Avenue of the Giants Marathon was born. 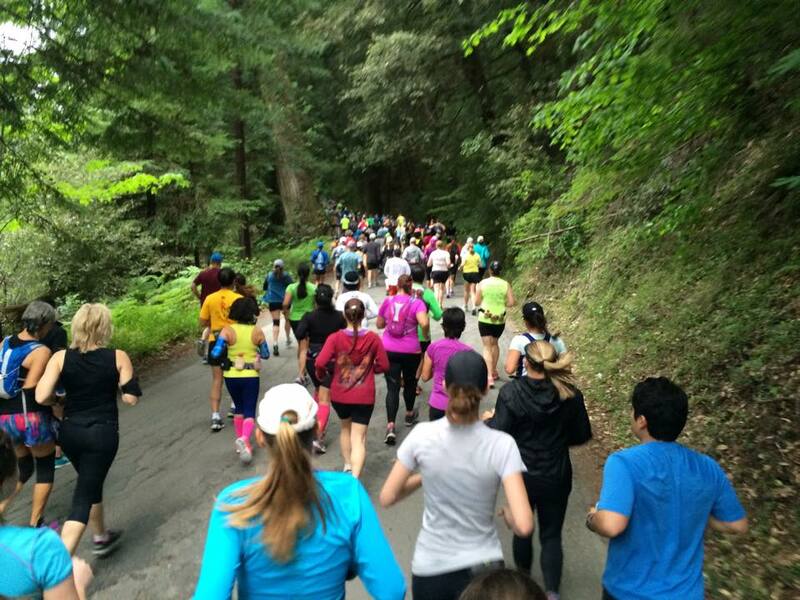 The Club decided that the Avenue Of The Giants area in Humboldt Redwoods State Park would be an ideal site for a marathon. The area was relatively flat, with a few interesting hills; the scenery was unsupportable; and traffic control would be no problem. Early May would be an ideal time to hold a marathon there. The weather would be warm, but not hot; and hopefully the rainy season would be over. Because the Park would not be officially open for camping, the park personnel and the businesses in Southern Humboldt would be glad to get a little early activity. With all this going for it, perhaps this race would take on regional or even national significance. All that was for the future, however. The immediate task was to have a successful beginning. 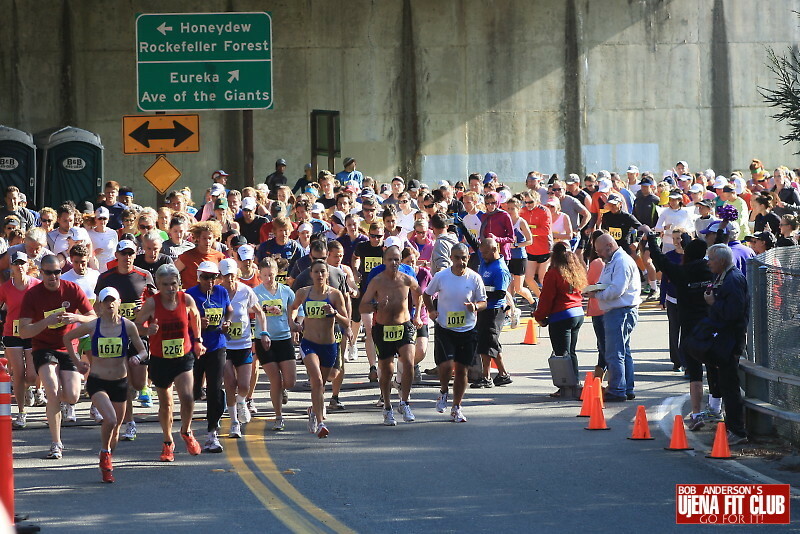 Thirty-two brave souls toed the starting line that Sunday in May. The weather gods had been kind. The weather was sunny and the spring flowers were at their best. The original starting line was located near Albee Creek Campground on Bull Creek Road (about half a mile beyond the five mile mark of the present course.) Runners would go up Bull Creek Road for a mile and a half to the first turn around; then back down Bull Creek Road for seven miles; go under the freeway bridge at Dyerville: then turn left onto the Avenue Of The Giants for six miles to the second turn around. From there they would return to Albee Creek. All thought the last five miles would be the toughest part of the race, perhaps matching in difficulty Boston's famous "Heartbreak Hill." When that first race was over, thirty runners had finished. The last five miles were declared to be "tough, but not impossible." All believed the event to be a success and the Club decided to make "The Ave" an annual event. An American, Frank Shorter, won the Olympic Marathon in Munich later that year, and another, Kenny Moore, came in 4'th. Their success helped spark the running boom in the U S, and the Ave was on its way. It would grow almost exponentially. By 1975 the number of entrants had increased ten fold. That year volunteers stayed up late into the night prior to the race painting numbers on oil cloth bibs. Runners had to be identified somehow. A finish line crew would be needed to hand out numbered sucker sticks so that places could be identified. A half marathon had been added to satisfy those who weren't ready to try a full marathon yet. Tee shirts would be given to all who finished the marathon. An effort was made to increase the number of aid stations in case some of the first timers got into trouble. To meet these costs, the entry fee was raised to $5.00. About 230 runners finished the marathon that day, many breaking the magic three-hour barrier. And still the weather gods smiled. In 1976 the number of entrants surpassed 500, and in 1977 topped 1100, making the Ave one of the larger marathons on the west coast. Because the field had grown too large to stage the race at Albee Creek, the starting line for the 1978 race was moved to its present location, the Dyerville Bridge, and the course was laid out as it is today. The half-marathon was dropped. Moving the starting line proved fortuitous, for 2000 plus runners decided to enter the race that year. Park officials became worried about the impact of so many people on the park and the Club agreed not to let the race get any bigger. Those were the golden days of running. At the Ave one could rub sholders with such notables as Walt Stack, Ruth Anderson, Dr. Joan Ulliot of literary fame, and Harry Cordellas, a totally blind runner from the Bay Area. Bill, Mad Dog Scobey had blazed a 2:17, giving the Ave some notoriety forattracting quality runners. Later Sister Marian Irvine, the "Running Nun," and Dr Paul Spangler, who at age 79 broke 4:00, would run in the shade of the Redwoods. And the weather gods were still happy. That would change in 1979. In those days runners would pick up their packets on Saturday if they wanted to beat the Sunday crowds. Volunteers would gather Saturday morning to hand out packets and set up the course. This day started out cool and partly cloudy, but by early afternoon, the sun was gone and the skies opened. Everything, including the workers' keg of beer was moved under the bridge. Six O'clock rolled around and still the rains came. There would be no camp fire and celebration that night. It rained all that night and all of race day. Those unfortunates who slept in tents woke soaked to the bone, but of course the race "must go on." As the appointed start of the race approached 2000 wet shivering runners tried to cram under the bridge to preserve a modicum of warmth. Of course the helpers fared even worse. Many unforgettable stories were spawned that day. The first, and to my knowledge the only, marathon wedding ceremony was performed under the bridge in the rain that day. The bride said she would take him however she could get him. Perhaps the couple shared their 30'th anniversary at the 2009 Ave. I hope they did. The Ave survived and continued to prosper. For the next few years the throngs continued to flock to the Ave. Then the running boom ended and numbers began to decline. Marathons were common place, and perhaps the sense of excitement and accomplishment one could get by training for and completing a marathon began to wane. During the late '80's and early 90's marathons across the nation were terminated. Only the big and famous seemed to prosper. Though numbers declined, the Ave survived, due to the efforts of a core of dedicated volunteers. The nature of the Ave has changed since the "glory days." It has become more laid back, a race where families and first timers, along with a cadre of regulars gather on the first Sunday in May to compete and enjoy the fabulous scenery.